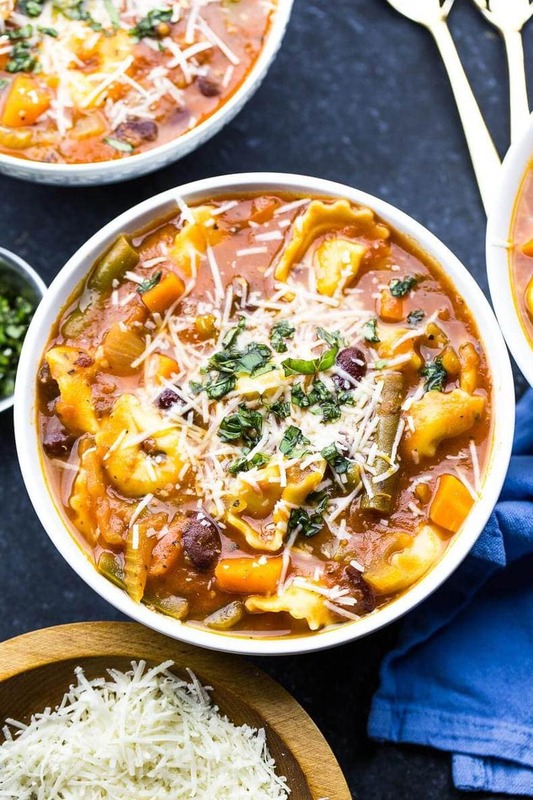 This 30-Minute Tortellini Minestrone Soup is a filling, high-fibe vegetarian dinner that comes together quickly for those busy weeknights! Oh winter comfort food, we meet again. 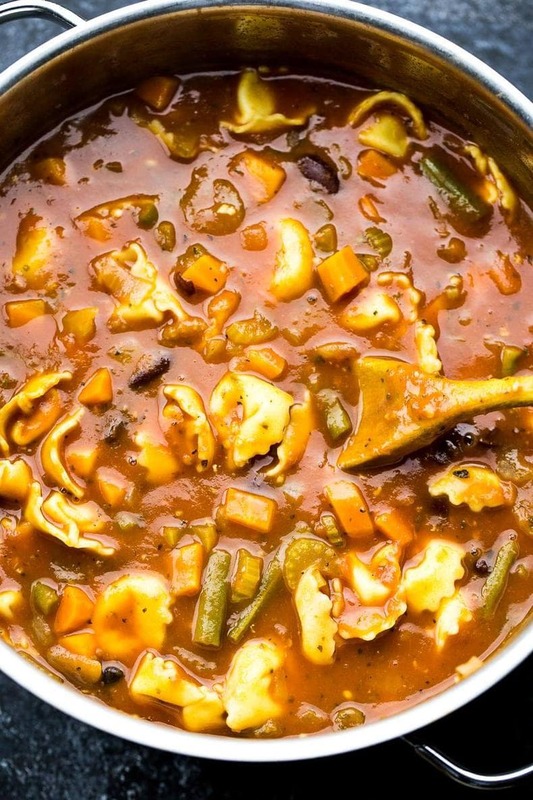 This time, in 30-Minute Tortellini Minestrone Soup form.? 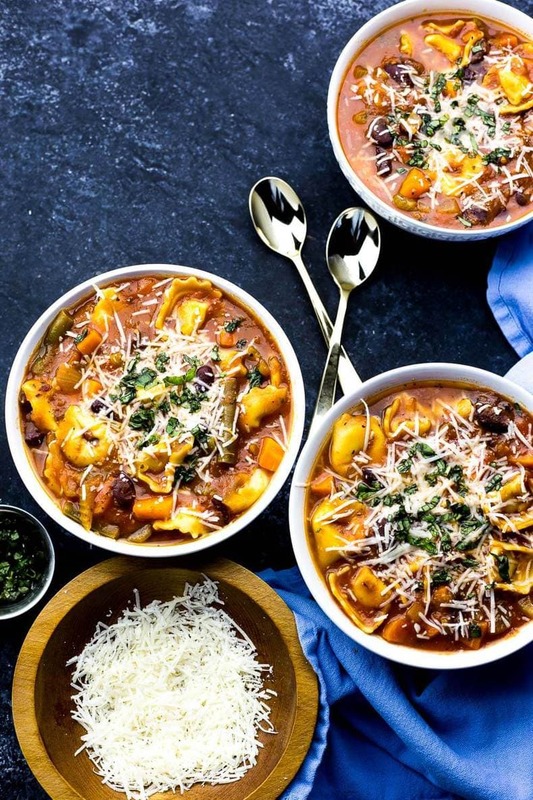 Big delicious bowls filled with cheese tortellini, green beans, carrots, kidney beans, celery, onions and Italian herbs in a rich tomatoey (is that a word?!) broth. This soup is really the most perfect recipe for Meatless Monday ever. Right now as I type this looking at all these pictures, there is a HUGE PILE OF SNOW outside. Yes, we got hit by one of the biggest snow storms of the year yesterday. Honestly, I keep saying that as if some dramatic snowmagedon happened this weekend, but it really wasn't much. In fact, I would classify it as more of a soggy mixture of wet snow and rain that came on and off all day yesterday, and it really wasn't too cold out compared to those -20 degree days either, but the slushiness and mess outside, along with the howling wind, made cozying up inside yesterday actually quite the treat. I don't know about you, but snowstorms actually make me miss the times you would enjoy outside as a kid, tobaganning and wandering around in giant, puffy snowpants, then coming inside cheeks all red and on fire, hanging up your hat and mitts to dry and then settling down with a giant mug of hot chocolate. Even as an adult, it's so satisfying to spend a few hours outside in the cold on a weekend, maybe go for a bit of a winter hike, and then come in to the welcoming warmth that is home. Only this time, Nutella Mocha Lattes are in order. Or something involving coffee at least.? I don't know about you, but I honestly feel like I don't get enough of those simplistic times! I feel like everyday I wake up on a weekend morning, part of me feels relaxed, but the other part of me is wondering what I need to get done that day, what errands need to be run, what I need to do to prepare for the work week. Like hellooooooo, isn't the weekend made for rejuvenation, rest and enjoyment?!!!!! Doing whatever you feel like doing???? I think sometimes we feel like we miss out on the weekend because we are so busy running around. Now that I'm a full-time working woman (I was a full-time student even a year ago – crazy, right? ), it's harder than ever to remind myself to slow down and just enjoy the simple things in life. Like sure, you've got laundry piling up and lots of cleaning to get done. Or you have groceries to get, chores that can only be done when you get a little bit of free time. But I think it's so easy to get caught up in this tendency to make every moment productive. Like you need to be doing some sort of chore in order to feel the reward of kicking back to relax. Working from home, I've been pretty good about setting boundaries for myself in terms of not working on weekends. So now, I think I'm going to try for more cozy weekends in doing nothing. After all, those are truly the best kinds of weekends.? 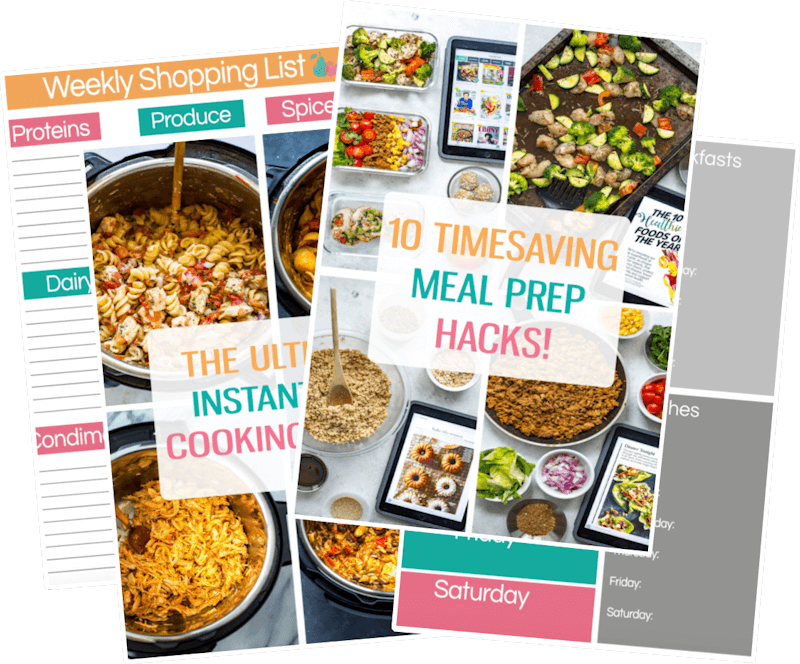 So if you're gonna be like me and push all that extra work you would normally get done on the weekend to the work week, you'll need lots of yummy meals that come together somewhat quickly. 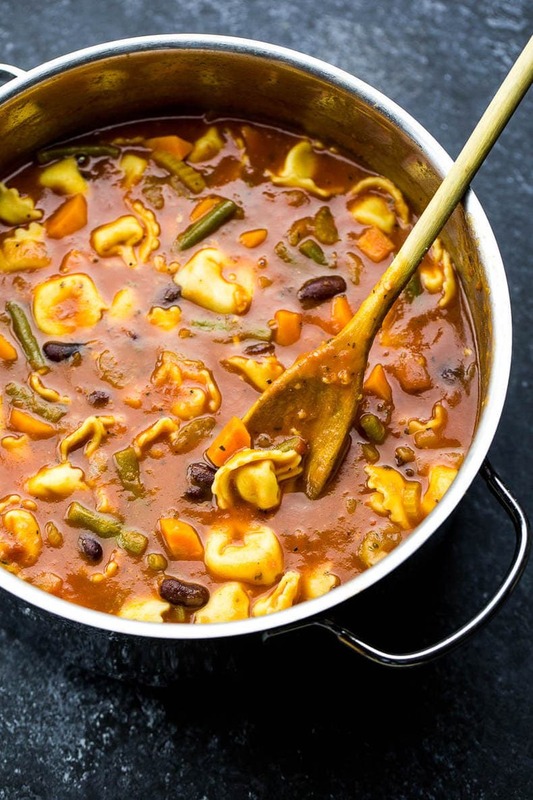 In favour of keeping things simple and delicious, I present you with my new favourite tortellini minestrone soup. 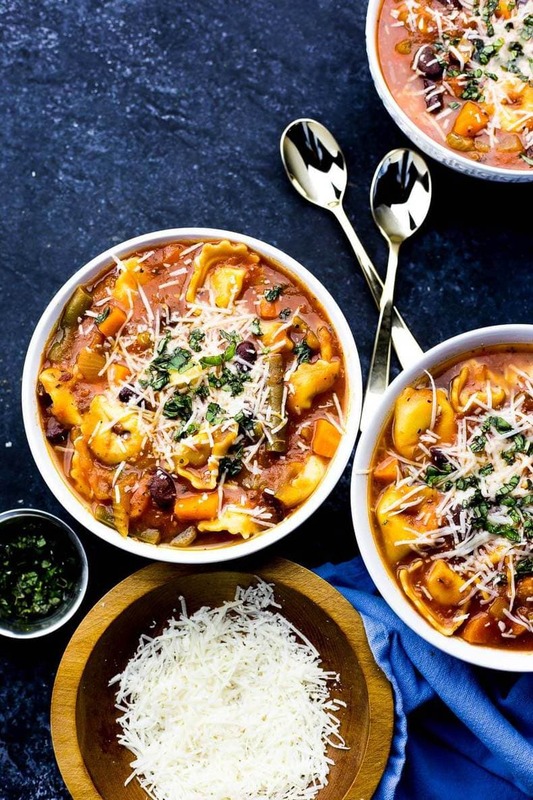 It's a fabulous hybrid between soup and pasta without it being too filling or coma-inducing. Even though I know it's still the middle of February, winter ain't going to last much longer. I'm already seeing shorts and t-shirts up in a ton of stores. Yes, SHORTS. And did you know that we are technically gaining 2 minutes of daylight every single day, starting from the winter solstice back in December? Before you know it, daylight savings will return and the sun won't set until, like, 7:30pm and it will practically be spring. So seriously, let's take as much time as possible to enjoy all the winter comfort food while we still can. 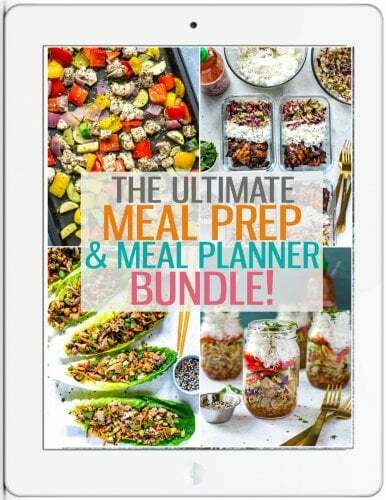 I literally want endless amounts of this kind of food before it's too late. I'm not the biggest fan of winter, but the FOOD. Dear lord. 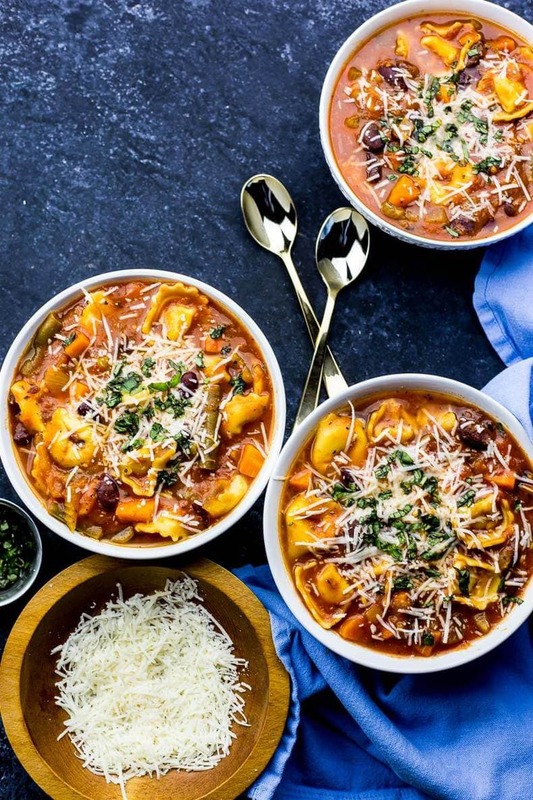 Give me all the tortellini minestrone I can handle. 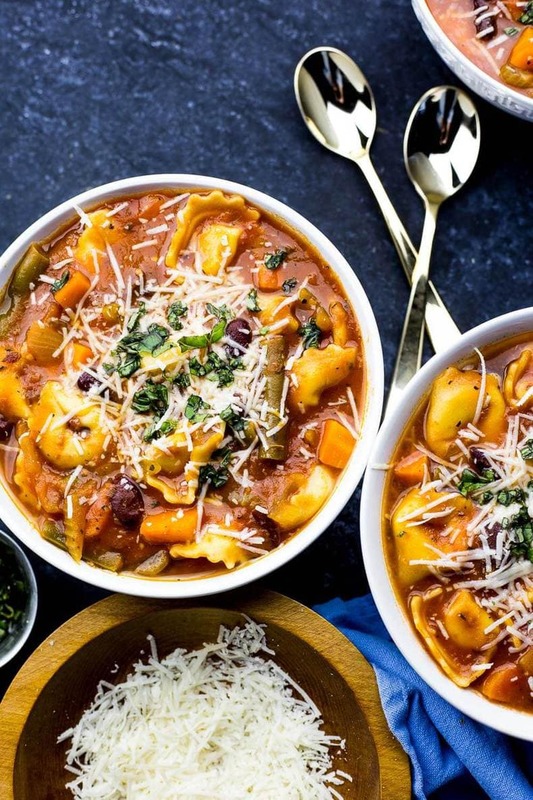 Will you be making this 30-Minute Tortellini Minestrone Soup? In a large, deep pot, heat olive oil over med-high heat. Add onions and garlic, sauteeing for 30 seconds until fragrant. Add celery and carrots, cooking another 3-4 min. 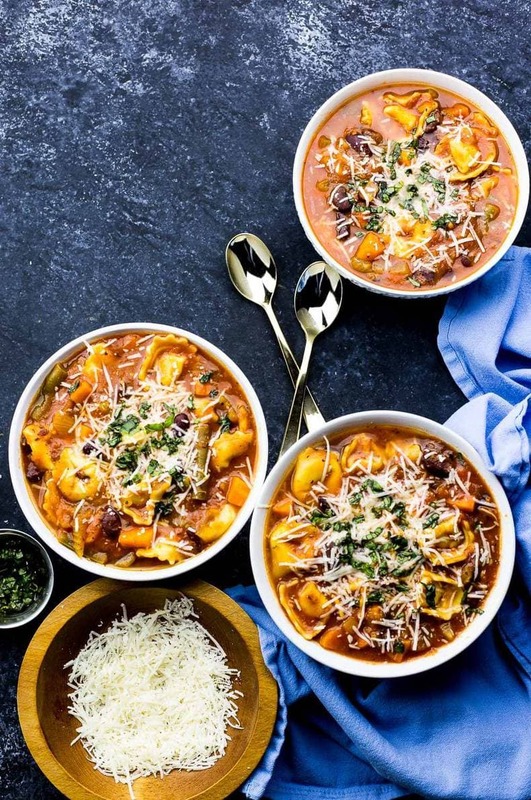 Add the rest of the ingredients with the exception of the cheese tortellini. Bring to a boil and then simmer for 20 minutes. Add tortellini and cook another 5 min. Serve in large bowls and top with fresh basil and freshly grated parmesan cheese. Enjoy! 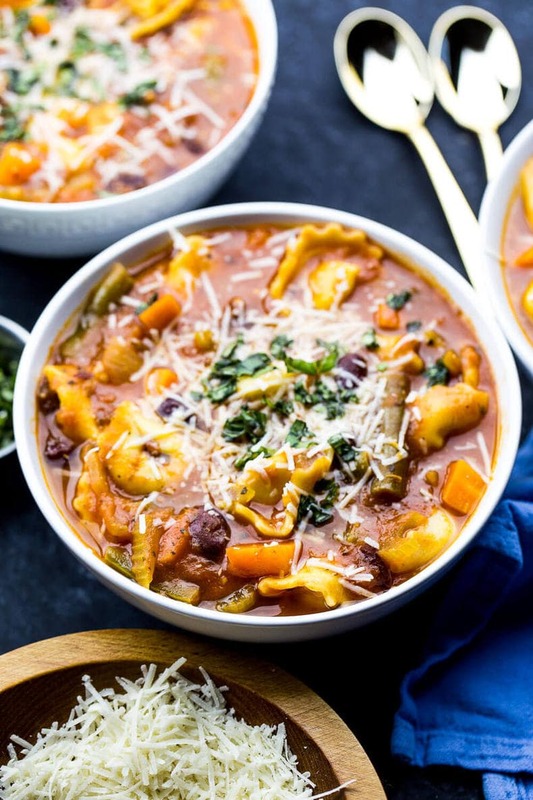 Love these types of soup – lots of fresh veggies and a little bit of a short cut for a fabulous satisfying dinner!